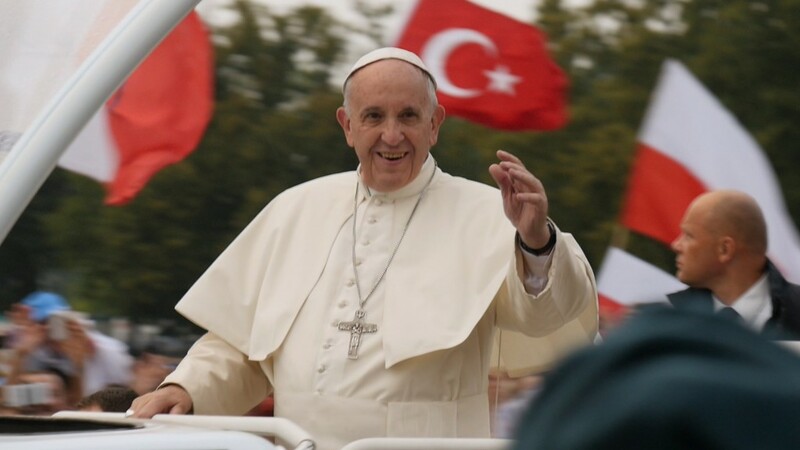 Pope asks young people, do you want empty thrills or the power of grace in life? Do you want a complete life? Pope Francis asked thousands of young people gathered from all over the world to celebrate World Youth Day 2016 in Krakow. 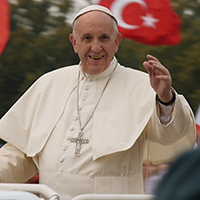 Gathered at Blonia Park, Krakow for the papal welcome on Thursday 28 July, young people listened attentively as Pope Francis said, ‘It pains me to meet young people who seem to have opted for “early retirement”. I worry when I see young people who have “thrown in the towel” before the game has even begun, who are defeated even before they begin to play, who walk around glumly as if life has no meaning. Deep down, young people like this are bored… and boring! But it is also hard, and troubling, to see young people who waste their lives looking for thrills or a feeling of being alive by taking dark paths and in the end having to pay for it… and pay dearly. It is disturbing to see young people squandering some of the best years of their lives, wasting their energies running after peddlers of fond illusions (where I come from, we call them “vendors of smoke”), who rob you of what is best in you. 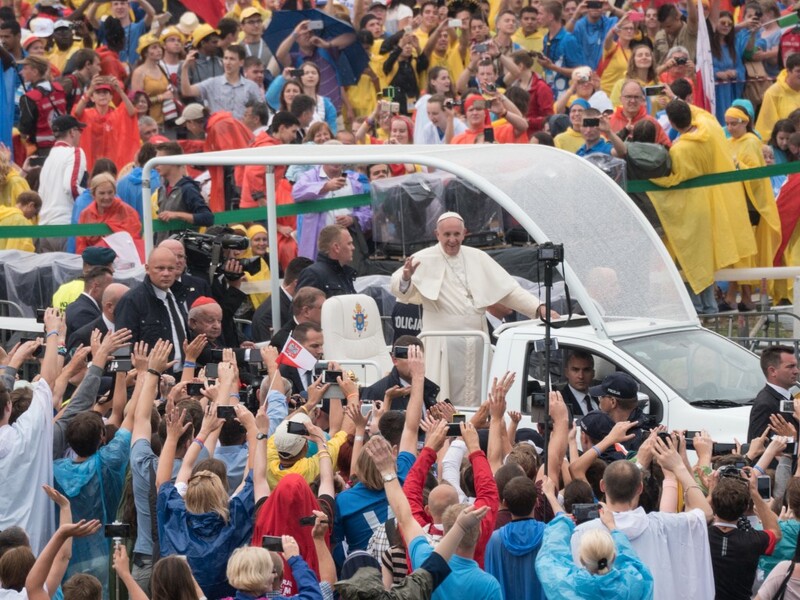 Pope Francis arrives at Blonia Park, Krakow for World Youth Day 2016. Photo credit: Diocese of Parramatta. ‘In my years as a bishop, I have learned one thing. Nothing is more beautiful than seeing the enthusiasm, dedication, zeal and energy with which so many young people live their lives. When Jesus touches a young person’s heart, he or she becomes capable of truly great things. It is exciting to listen to you share your dreams, your questions and your impatience with those who say that things cannot change. For me, it is a gift of God to see so many of you, with all your questions, trying to make a difference. It is beautiful and heartwarming to see all that restlessness! ‘Today the Church looks to you and wants to learn from you, to be reassured that the Father’s Mercy has an ever-youthful face, and constantly invites us to be part of his Kingdom. Aussie Pilgrims from the Diocese of Broken Bay enjoying the papal welcome. ‘Knowing your enthusiasm for mission, I repeat: mercy always has a youthful face! Because a merciful heart is motivated to move beyond its comfort zone. A merciful heart can go out and meet others; it is ready to embrace everyone. A merciful heart is able to be a place of refuge for those who are without a home or have lost their home; it is able to build a home and a family for those forced to emigrate; it knows the meaning of tenderness and compassion. A merciful heart can share its bread with the hungry and welcome refugees and migrants. To say the word “mercy” along with you is to speak of opportunity, future, commitment, trust, openness, hospitality, compassion and dreams. During the meeting, the pope received a “pilgrim’s rucksack” similar to what each World Youth Day (WYD) pilgrim received. On route to Blonia Park, Pope Francis took a tram along with a group of young people with disabilities. During his address the Holy Father thanked ‘all those who made it possible for us to be here today, who went the extra mile so that we could celebrate our faith’. The ceremony was filled with colour, music and dance as a youth delegation from each continent performed a native song, dance and referred to a local saint. For Australia, an icon of Saint Mary MacKillop was brought to the altar. Referring to Saint John Paul II, he said, ‘In this, the land of his birth, I especially want to thank Saint John Paul II, who first came up with the idea of these meetings and gave them such momentum. From his place in heaven, he is with us and he sees all of you: so many young people from such a variety of nations, cultures and languages but with one aim, that of rejoicing that Jesus is living in our midst. To say that Jesus is alive means to rekindle our enthusiasm in following him, to renew our passionate desire to be his disciples. What better opportunity to renew our friendship with Jesus than by building friendships among yourselves! What better way to build our friendship with Jesus than by sharing him with others! 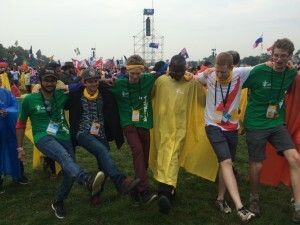 ‘Jesus called us to this Thirty-first World Youth Day. Jesus tells us: “Blessed are the merciful, for they shall find mercy (Mt 5:7). Pilgrimage to the papal welcome. Aussie pilgrims dancing during the papal welcome. ‘All together, then, we ask the Lord: “Launch us on the adventure of mercy! Launch us on the adventure of building bridges and tearing down walls, barriers and barbed wire. Launch us on the adventure of helping the poor, those who feel lonely and abandoned, or no longer find meaning in their lives. Send us, like Mary of Bethany, to listen attentively to those we do not understand, those of other cultures and peoples, even those we are afraid of because we consider them a threat. Make us attentive to our elders, as Mary of Nazareth was to Elizabeth, in order to learn from their wisdom. In reference to elders, Pope Francis encouraged the young people to ‘spend time with your grandparents, they are full of wisdom. Listen to them’. 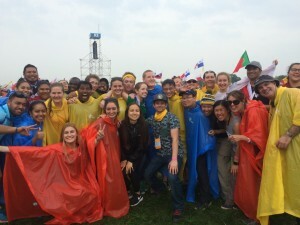 This entry was posted in Special interest, World Youth Day and tagged Krakow, World Youth Day, World Youth Day 2016, Young People on July 30, 2016 by ACBC Communications.